Domestic and worldwide events can always threaten energy costs, including the cost of propane. 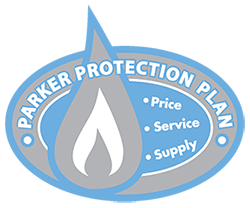 We at Parker Gas have no control over when gas prices rise or fall—but we do need to adjust our prices according to the per-gallon market price when we deliver propane to your home. Rather than ride out these unavoidable pricing fluctuations, many of our customers prefer the certainty of enrolling in our Pre-Buy Price Protection Plan. Pay 100% of your annual fuel costs based on current fuel prices and get a 10¢-per-gallon discount. Pay 30¢ per gallon down with no discount. If prices go up during the season, you don’t have to worry because your price has already been set at a lower price. However, if prices drop, your price remains at the pre-buy price, because we purchase fuel for you from our suppliers at the time we lock in your price. We can’t advise you when to buy your fuel, but we feel it’s important that you have this choice. So if you feel that propane prices are low or will be soon going up, you can potentially save on propane costs by locking in a pre-buy price. Contact us to learn more about Pre-Buy Price Protection or to enroll in the plan today!